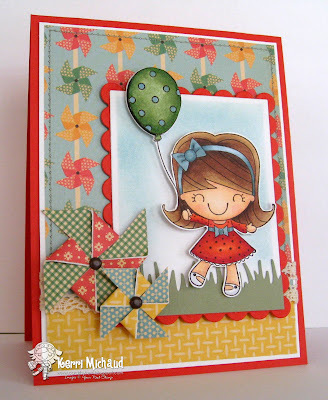 Your Next Stamp Challenge #40~Texturize It! Please Scroll Down for the RRR Blog Hop! Hello! It's time for a new challenge at Your Next Stamp, and this time we want to see you add some Texture to your projects! 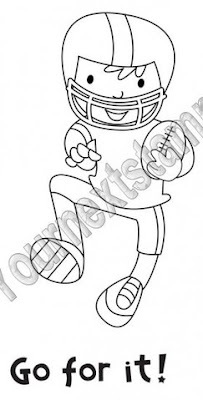 Football Dude! One random participant will win this stamp set. If you use a YNS image on your project, you will be entered TWICE! You will also be eligible for the Top Pick prize which is $5.00 in YNS bucks and the Top Pick Blinkie. Thank you so much for stopping by today. Make sure you enter my Blog Candy! I have an adorable YNS image in the pot~Flower Bouquet Fhiona (thank you, Karen!!!) along with several other stamps, some dp, buttons, and some fab ribbon from Really Reasonable Ribbon! Have a wonderful Wednesday! Absolutely LOVE this gorgeous card! I am wondering how you made the tiny pinwheels that could pass as flowers. Did you use a die? And your BG paper even has pinwheels in it! ACK! total cuteness!! Love the pinwheels! She is so cute and your card is so cheerful. I like your pinwheels. Wish I could comment on all that I've missed but I've been reading your blog and looking at all of your projects this afternoon. I'm so sorry for the loss of your sweet little doggy Hannah. Oh Kerri!! This is gorgeous! I just love your colors and design!! The pinwheels is such a fun and beautiful touch!! Stunning coloring too!! You are uber talented girl! Kerri OH MY GOODNESS I LOVE LOVE these colors, these papers and look at your pinwheels...girl thsi is over the top WONDERFUL!!!!! Kerri I don't think this card couldn't be any cuter those pin wheels are awesome! This is just adorable girl!!! I LOVE the pin wheels, such a fun touch! What a sweet card Cindy, wonderful! Totally perfect in every way! LOVE these papers with her and, of course, your coloring ROCKS!!! Another sweetie! This paper is still one of my faves :>) Did you make the pinwheels or use a die? Love it! I have got to try those super simple pinwheels!